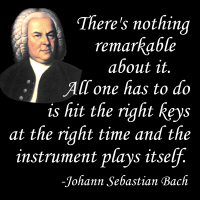 These succinct and immortal words of Johann Sebastian Bach have long been used to inspire and/or chide music students and professional musicians alike. Whether the great and beloved musical genius meant this wry observation to be tongue-in-cheek or deadly serious is the subject of much debate. All we know for sure is that people love this wry quote by the Master! Buy it now on a t-shirt, hoodie, mug, tote bag or other quality giftware and apparel items. Choose something for your favorite musician, music teacher or student, exclusively from GearGems! Bach lovers should also not miss this great portrait design as well! Here is the same design on items printed by PrintFection (please click).